As we walk into New Fantasyland at Walt Disney World Resort, that same rush of excitement washes over me. It’s the feeling I experienced years ago, stationed in front of the television to watch Walt Disney create magical moments every Sunday night. This new area in Magic Kingdom would definitely warm the heart of Walt Disney who had the vision to build the Magic Kingdom and the original Fantasyland forty-one years ago. It took Walt Disney Imagineers – that’s what they call the people who create the magic that is Disney – from more than 140 disciplines, everyone from writers to engineers, to bring Fantasyland to life.Each drew inspiration from Walt Disney and his penchant for spinning imaginative tales. “It’s all about storytelling,” says Walt Disney’s Chris Beatty, imagineer and creative director for New Fantasyland. And, at Disney, it’s also about celebrating new storytelling achievements. If there’s one thing Walt Disney World Resort knows how to do, it’s throw a grand opening party. The Resort did just that last December when it brought in Ginnifer Goodwin, who plays Snow White on the hit ABC show “Once Upon a Time” and American Idol-turned-pop-star Jordin Sparks to open New Fantasyland. After jump-starting the festivities, they invited all of us crowded around Cinderella Castle to visit the new attractions, just steps away. 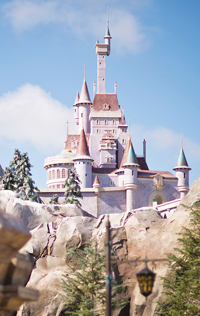 Walking up to the magnificent Beast’s Castle, which sits in the shadows of Cinderella Castle and is home to the new Be Our Guest Restaurant, is an experience itself. The bridge leading to the huge castle door is flanked by impressive stone figures. Two massive lion-like statues guard the entrance.The lavish restaurant is divided into three sections. The first is a spacious, elegant ballroom centered by a massive chandelier measuring more than 12 feet tall and 11 feet wide and outfitted with over 84 candles and more than 100 hanging jewels. The gallery of windows in the back of the room – just one of the 115 rooms in this castle – overlooks snowcapped mountains with a backdrop of falling snow, just one of the many details inspired by the “Beauty and the Beast” film. 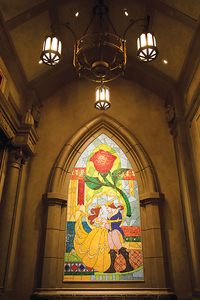 The intimate Rose Gallery is adorned with rose accents, paintings of the characters in the epic tale and tapestries.In the center is a music box nearly seven feet tall with a twirling Belle and the Beast. The West Wing of the Castle is a dark, ominous room with cobweb-like tapestries hanging from the ceiling, tattered drapes at the windows and a mysterious painting above the fireplace with special features that you could miss if you don’t pay close attention. Don’t be surprised if you hear thunder in the distance. It’s all part of the mystery. The restaurant offers lunch service by day and full-service table dining at night featuring French-inspired cuisine, everything from mussels steamed in white wine and oven-baked ratatouille – a nice treat for those of us that like our veggies — to triple-chocolate cupcakes and passion fruit. New Fantasyland’s French fairytalestyle village also is home to the very innovative Enchanted Tales with Belle attraction where an enchanted mirror becomes the gateway to a new kind of interactive storytelling experience.Disney has gone to great lengths to make this attraction and its counterparts in Fantasyland as authentic as possible.”The goal was for us to create characters that are real,” says Beatty, who was responsible for leading the creative team in developing the vision and implementation of the new area. As my daughter, Angela, and her fiance, Andy, and I stood patiently with the crowd in Maurice’s cottage – Belle’s father in “Beauty and the Beast” if you’re not familiar – our Enchanted Tales host pointed out a book with a bite taken out of it, a detail that pays homage to the film.Then, in a pixie-dust moment we were transported into the Beast’s library filled with 12,000 books. It is at that moment that we stepped into the story of “Beauty and the Beast” with Belle, Madame Wardrobe, and Lumiere. The three retold the “tale as old as time” with the help of some audience members – something you really have to see to appreciate. New Fantasyland is also home to Under the Sea – Journey of the Little Mermaid, an attraction where you travel above and below the waves in clamshells, and the the sky. Dumbo’s new sporty red and gold colors are inspired by the fifties- and sixties-era retro tin toys. The attraction is connected to the indoor big top where you participate in circus-themed activities and games while waiting to ride the lovable pachyderm. When you enter the big top, you will get a circus ticket pager that holds your place in line and notifies you when it’s your turn to ride. Storybook Circus also features the Casey Jr. Splash ‘N’ Soak Station water play area, Pete’s Silly Sideshow where you meet some Disney circus stars and the Fantasyland Train Station as well as Barnstormer, a roller coaster with daredevil-style dips that has you following the twisting, turning flight of stuntman Goofy. 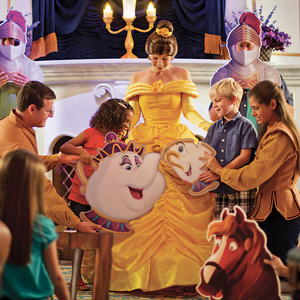 The much-anticipated Princess Fairytale Hall, where the Disney princesses will meet their loyal subjects, opens later this year. And, for the first time that I can remember, Disney is letting you get a glimpse through peepholes in the construction partition of the new Seven Dwarfs Mine Train, which opens in 2014. The family-style coaster features a first-of-its-kind ride system with a train of vehicles that swings back and forth. I would be remiss if I didn’t mention our fun digs at Disney’s Art of Animation Resort. The resort has four distinctly designed wings – Finding Nemo, Cars, The Little Mermaid, and our cozy little home away from home, The Lion King. All of the wings except The Little Mermaid offer large family suites. We were impressed by the landscapes outside our wing, which reflected the “The Lion King” film, complete with an elephant graveyard play area. Every time we walked back to our building we made sure to glimpse over at the life-size replicas of Pumbaa, Timon and Simba dancing across a log bridge in true hakuna matata style. Even the interiors of the rooms were themed to the film, from the shower curtains with Pumbaa and Timon to the headboards with Zazu. My daughter Angela, who has been to Disney World more than 12 times and has considered having her wedding at Disney, was particularly impressed with the hotel’s gigantic lobby, complete with giant sketchbooks filled with some of her favorite Disney characters. That’s just the type of reaction Disney was going for. “Our goal was to make guests feel like they have been immersed in the artistry and enchantment of Walt Disney and Disney Pixar animated classics,” says Imagineer Frank Paris of the Art of Animation Resort. We think they nailed it.